I think the toddler stage is pretty entertaining most of the time... especially if you've watched another child go through it and know that they eventually move through the different challenging stages and grow up a bit. Every toddler is different and moves in and out of stages at a different pace. Some won't hit, some won't bite, some won't throw huge tantrums, some won't ever run away from you in a public place, some won't yell or blatantly disobey you, some won't color all over your walls, some won't cry every time you leave their side, etc. Some toddlers will do everything mentioned above and then more. If you are blessed with a toddler that skips doing some (if not all) of these things, be happy and try not to judge the rest of us. One thing I've noticed as a parent is that every time I say out loud, "____ has never done ____" I can pretty much guarantee that he'll start doing it the following week or sometime soon. So I like to stay quiet and enjoy the happy easy stages and then I spend a lot of time praying and reading during the harder ones to figure out what I am doing wrong! As a teacher of children with severe behavior disorders for many years, I sometimes thought parenting would be a piece of cake. While my background and experience has definitely helped me as a parent, I still feel like I have a lot to learn on a day to day basis. As I'm entering my 35th week of pregnancy and baby #3 will be arriving soon, I am a little bit tired... and I figured some of you might be tired parents too, so I'm going to share a few favorite toddler parenting resources with you that are hopefully helpful, along with a few parenting tips that have been useful to me lately. They are not anything new, just good reminders for me. Please share your tips if you have them too! 1. Save your energy and don't judge other parents. The more I get to know other parents, the more I realize, everyone is mostly just trying their best. I feel like people are constantly looking at my crazy toddler, energetic 4 year old, and my pregnant belly and are thinking, "How does she think she is going to handle another kid?" To be honest, I don't know... but I sure am going to work really hard to be the best mom that I can be anyway. When I feel like I am judging other moms that I see parenting differently than me, I try to step back and look at my own weaknesses as a parent and focus on them instead. I am definitely not perfect... so why waste my energy on others when I could be working on making myself better?! 2. Find your reset button. 3. Say sorry and be willing to compromise. We aren't always right as parents. We'll make mistakes, we'll say silly things, and sometimes we'll set limits that are unfair or unreasonable. Instead of enforcing them because we feel like we'll lose face, sometimes we just need to acknowledge that we were wrong or we need to compromise because sometimes our kids are actually right or come up with a good idea. I have to remind myself that I won't lose complete and utter control of my kids if I say yes sometimes. Yes, if they ask for an M&M when they notice me sneaking them :) Yes, if they ask me to read a book with them and I'm trying to hurry and get the laundry done. Life is happier when I say, "yes" and my "no's" actually mean more because I am not saying them all the time. 5. Learn about setting effective limits and then practice! Setting limits and finding appropriate consequences or allowing your child to experience the natural consequences of their actions is tough... especially while still being a loving empathetic parent! I am constantly practicing this and re-teaching myself. How to Set Effective Limits for your Child is a great article by AHA Parenting. It talks through how to set limits with empathy. One of the things that I have learned a lot about over the past few years is how to set limits while still acknowledging my child's feelings... which are sometimes really negative because she doesn't like my limits. I have also learned a lot about how to set effective limits so that my kids don't feel like I am unfair and constantly just making rules. This article is filled with so much great information that you'll want to read it more than once. 4 Challenging Behaviors and 4 Ideas for Dealing with Them by Parenting Starts Here shares some typical toddler behaviors and some clearly written ways to deal with them. In the hustle and bustle of parenting it is easy to forget some of the simplest strategies. My favorite reminder in this post is, "Forgive yourself, apologize and move forward! If you become frustrated by your toddler’s behaviors and respond in a way that doesn’t match up to your expectations of yourself, take a deep breath and a break if needed." Biting, Hitting, Kicking, and Other Challenging Toddler Behavior by Janet Lansbury is filled with great reminders about how we can respond to these challenging behaviors in a positive controlled way so that children feel safe. Taking behaviors like these personally can negatively impact how we respond... instead we need to remember that the behavior is our child's call for help and this perspective can allow us to gain the confidence and patience that we need to deal with the situation in a calm way. Getting rid of "NO! "- This guest post by Jillian of A Mom with a Lesson Plan over at The Little Stories shares some easy ways to minimize the word NO in your toddler's vocabulary. I am a huge fan of focusing on the positive and telling kids what to do instead of what NOT to do, so this article has some great reminders! If you've read all of these articles, hopefully you feel a little more confident as a parent now. 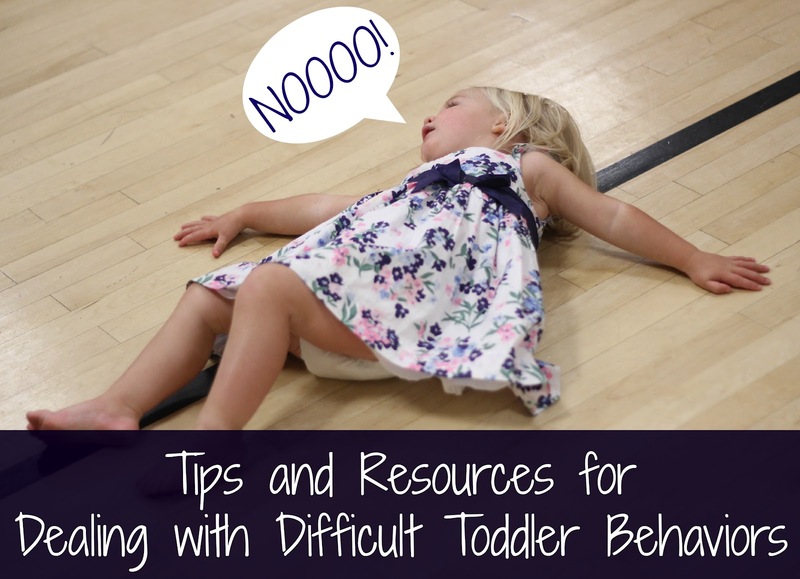 Do you have any favorite resources on dealing with challenging toddler behaviors? What is the hardest stage your child has gone through? Any tips or advice for us? I'm very interested to hear your thoughts on three small kids (I just found out I'm pregnant and have a 3 and a 1 year old)! LOL. For now, this article is great too. Congrats!!! :) Sounds like we will both have a busy year! I know how you feel, but not the pregnant part. I have 3 and they keep me very busy. i'm a mother of 4 and you would think that i have this parenting thing down to a science. However every child is different and what works with one doesn't always work with another one so its nice to try other ways and to keep trying to be a better parent every day. Thanks these tips were very helpful. I think we've all had that moment where we are embarrassed by our little one and wondered what to do no matter how prepared we think we are! This is wonderful post and thanks for sharing our guest post my A Mom With A Lesson Plan! What you said is so true. Sometimes I feel happy when the kids realize that I mean my no's because I tend to say "yes" for many things. Life is happier when I say, "yes" and my "no's" actually mean more because I am not saying them all the time.--- I really like this sentence and I would love for all my non-blogging mommy friends to be able to see this. Can I put this up on my blog's fb page and my personal page with a link back to this article? I'm Suja Balaji and I'm part of KBN. I like your tips! They're all very straightforward and realistic! I always try to limit the amount of "no's" that I say to my 2-year-old so that it doesn't become ineffective. Instead, I'll try to say something like, "We don't throw the toy. Put it gently in the box. Let's try again." Great blog! I say yes too. Just have to in order to be happy. Our first son was a n angel and did not do any of the difficult behaviors mentioned...but our second son, who is now almost 3, has exhibited every one of them!!! It is so very trying and when I lose my cool (which I try really hard not to) I feel so horrible! Thank you for this article <3 I hope I can utilize some of these tips to get us past this stage with our mental health still intact! Thank you for your tips! especially number 1. This defiantly will help me to better explain to my fiancee why our almost 2 yr old daughter does what she does. I am the oldest of 8 kids with the youngest being 8 years old so I've been through several different types of toddler stages where's my fiancee is 3rd boy out of 4 so he didn't grow up with toddler antics like I did.